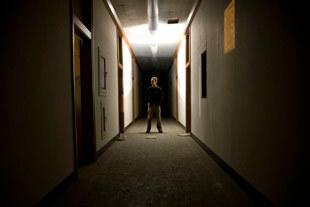 Popping a flash from behind in the former Administration Building at Bethlehem Steel Corp. Photo by Andre Hermann. Scott Haefner is a professional photographer and web developer based in the San Francisco Bay area. He primarily shoots urban and scenic landscapes, as well as kite-lofted aerial photos. At an International Kite Aerial Photography Conference in November 2002, Scott was recognized as the “Most Promising New KAPer.” In addition, Scott’s work has been featured in numerous magazines, newspapers, and books, including the San Francisco Chronicle, Los Angeles Times, BBC News, Photo District News and Photo Techniques, as well as specials on the Discovery and History Channels. All photographs on this site are copyright © 1989 - 2019 Scott Haefner, unless otherwise noted. This web site and accompanying photographs are registered with the U.S. Copyright Office. Photos are available for licensing, for use in everything from books to brochures to web sites. The fee depends on intended use, printed size and distribution. If you wish to post my photos on a personal, non-commercial web site (such as a blog), no licensing fee is required, but you must give me credit and link to my site (scotthaefner.com). For information regarding commercial, corporate, editorial or personal uses, or if you have any questions, please . I also perform contracted, on-location shoots. “The design” of this site (the unique combination of layout, images, colors, photos, etc.) is copyright © Scott Haefner and may not be reproduced. Feel free to learn from the ideas and techniques used here, but do not reproduce the site as your own work. Logo designed by Raber Umphenour, Carbon Arc Media. Thanks to Chloe Bowen and Raber for coming up with creative titles for many of the photos.